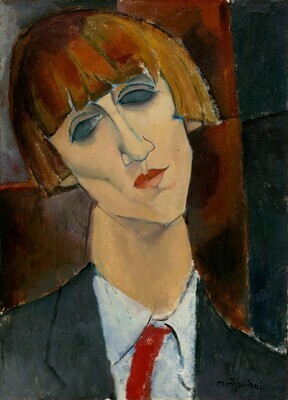 Probably (Etienne Bignou, Paris); (Leicester Galleries, London); sold 20 April 1927 to Chester Dale [1883-1962], New York; bequest 1963 to NGA. According to Chester Dale papers in NGA curatorial records, Leicester bought the painting from a private collector, whom Dale identified as Bignou. Amedeo Modigliani: Retrospective Exhibition of Paintings, Demotte, Inc., New York, 1931, no. 10. Paintings from the Chester Dale Collection, Philadelphia Museum of Art, 1943-1951, unnumbered cat., repro. Twentieth Century French Paintings from the Chester Dale Collection, National Gallery of Art, Washington, 1952, no. 43, repro. Modigliani: An Anniversary Exhibition, J. Paul Getty Museum, Malibu; Kimbell Art Museum, Fort Worth; National Gallery of Art, Washington, D.C., 1983-1984, unnumbered brochure [exhibited in Washington only]. Dale, Maud. Before Manet to Modigliani from the Chester Dale Collection. New York, 1929: no. 96, repro. Paintings from the Chester Dale Collection. Philadelphia, 1943:, unpaginated, repro. Twentieth Century French Paintings from the Chester Dale Collection. National Gallery of Art. Washington, 1952 (2nd ed., 1960; rev. ed., 1965): 43, repro. Twentieth Century French Paintings from the Chester Dale Collection. National Gallery of Art, Washington, D.C., 1960 (2nd ed. ): 45, repro. Summary Catalogue of European Paintings and Sculpture. National Gallery of Art, Washington, 1965: 91. Twentieth Century French Paintings & Sculpture of the French School in the Chester Dale Collection. National Gallery of Art, Washington, 1965 (rev. ed. ): 56, repro. European Paintings and Sculpture, Illustrations. National Gallery of Art, Washington, 1968: 80, repro. Ceroni, Ambrogio, and Leone Piccioni. I dipinti di Modigliani. Milan, 1970: no. 103, repro. Ceroni, Ambrogio, and Françoise Cachin. Tout l'oeuvre peint de Modigliani. Translated by Simone Darses. Paris, 1972: no. 103, repro. Walker, John. National Gallery of Art, Washington. Rev. ed. New York, 1984: 588, no. 907, color repro. European Paintings: An Illustrated Catalogue. National Gallery of Art, Washington, 1985: 274, repro.